I’ve been simultaneously healthy and ridiculously unhealthy this past weekend – unhealthy because of a certain burger & fries combo, eating my weight in liquorice and then, today, making it my mission to hunt down proper gelato and devour it like there’s no tomorrow. However, I’ve also been walking my fair share of steps during the past two days, which is where my healthy argument comes to play. Yesterday my walking was mostly due to hunting down ice cream, but surely these two things cancel each other out? Right?! Yesterday morning I googled the best ice cream parlours in London, and came across a place called Scoop Gelato which had had a lot of good reviews and happened to also be in a very nice location. 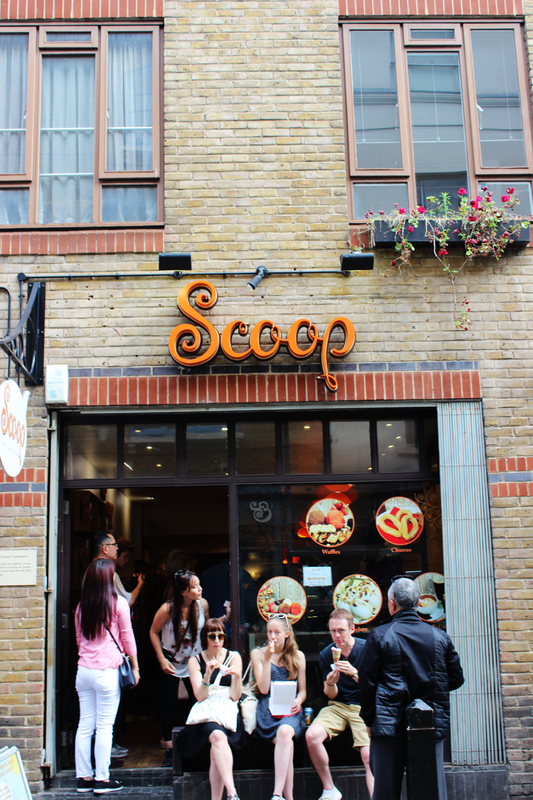 Scoop have four parlours in London from which we decided on the Covent Garden one as the weather was absolutely beautiful and we thought it would make for a pretty nice walk. So, we headed to the station, took a train to Blackfriars and then made our way through the beautiful and historic Fleet Street to get to our ice cream. I originally thought the parlour would be in the Covent Garden market, but it’s actually a little bit further along, in the picturesque Seven Dials district. This suited me more than well as I like to avoid crowds as much as I possibly can and it’s pretty much impossible to do that in Covent Garden during weekends – Seven Dials was a lot calmer and a lot less stressful! As you can see the parlour has quite a few different flavour options which definitely didn’t make choosing very easy..! I decided to try the lemon sorbet (my favourite flavour in the world!) and the salted caramel one and I thought these two complemented each other very nicely. Jim was a bit hungrier and went for three (!) flavours: dark chocolate, banana split & mango sorbet. I tried all of them and can vouch for them too – especially the banana split had an amazing and distinctive flavour which didn’t feel too sweet or artificial at all. Two flavours were £4.50 and three were £5 – pretty pricey but the quality was really good and I guess they have to pay their central London rents somehow! I eat a ridiculous amount of ice cream during summers, but this was actually my first proper gelato this year, so I’m very happy to say that it didn’t disappoint at all and I enjoyed all of the flavours I tried! My next ice cream mission (sounds so official!) is to go to this ice cream parlour in Soho later this week – they specialise in ice cream that anyone with a food allergy can enjoy: their ice cream is all free from wheat, gluten, dairy, eggs and nuts – pretty impressive, huh? I’ll try to try it this week and then report back to you, but, in the mean time, please tell me where you think I can get the best ice cream in London? I’m on a mission!